Here we are on the set of the IBKC FUNdraiser, with Mr Batsel and Mr Batsel. The gentlemen have been polishing up their phone skills, and are eagerly awaiting your calls! Shhhh. Please don't talk to me. I'm running lines in my head right now. OK. I'm ready. Really ready. I think I've really got this down. I mean I'm going to ace this today. I'm going to REALLY knock it out of the park. Be prepared to eat my dust, brother. OK. I wasn't prepared for THAT. 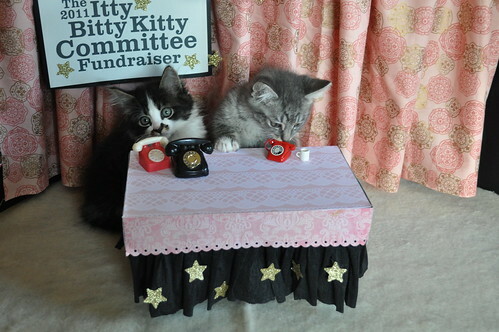 While the kittens gather their wits, let's try making our donations ONLINE. Our FUNdraiser is growing to a close, but we still have three squillion to go to meet our goal. 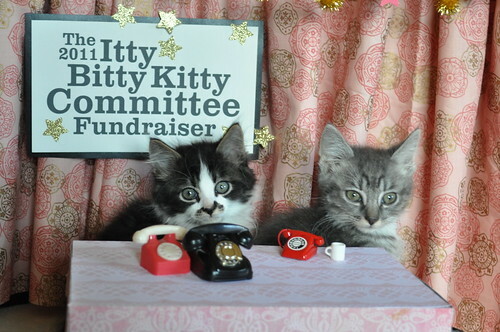 Please help homeless cats and kittens out by making a tax-deductible donation out today. Thanks for getting us this far. Now, let's take it home! Question on the name of this litter: is it pronounced BATsel or batSEL? Yikes!! Turn down the ringer! 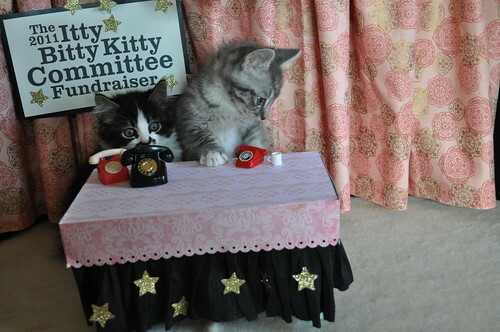 TheCilleyGirl: I think in a previous comments thread the kitten-namer said it was pronounced BAT-sel. HILARIOUS!!! That last picture is just priceless... how DO you do it?!? Wonderful story about the boys, they sure are trying hard to get it right, aren't they? ((turning down ringer)) just an itty bitty bit! I just went HA! out loud at work. This is such a NSFW site. I just had a very frustrating workday, and this made me smile from ear to ear! The DRAMA!!!!! You are so hilarious and clever. It's completely unfair that I can't live next door. Or at least the next state over. Hee! Love that little tail sticking straight up! I just laughed so loudly that Kaz the bengal kitty hopped up on the arm of my chair and looked at me like I was nuts. Cute photos. 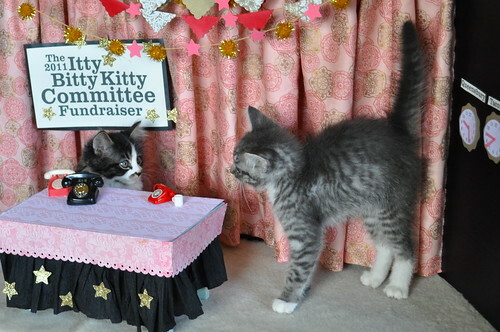 LOL - you are a genius when it comes to composing these kitty photo stories!